As part of the celebration, Lingle Court was named to recognize the $700,000 gift by Paul and Pat Lingle. 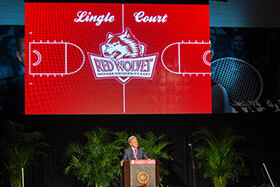 The Lingle name will be permanently etched on a plaque in the building and appear on the Red Wolves court. Lingle Court will also provide space to host student activities such as concerts and pep rallies as well as a variety of community events. President Michael A. McRobbie said the Student Events and Activities Center would enhance the vitality and functionality of the campus, and provide students with opportunities for engagement and leadership. He expressed gratitude to the donors and community for their support of IU East and for the center. Chancellor Kathryn Cruz-Uribe emphasized the close connections shared and how working together has brought positive changes for the region. The Student Events and Activities Center Celebration was held August 19 for those who contributed to IU East’s fifth building through Bold Aspirations: The Campaign for the Student Events Center and the “Save my Seat,” campaign. The center will promote student success through a comprehensive offering of programs in health and wellness, physical education, athletics, student activities, and special events. Since 2007, IU East has doubled its student enrollment to over 4,700 and offers over 50 bachelor’s and master’s degree programs. Lingle shared how important the Student Events and Activities Center is to the region. “The Student Events and Activities Center will be the heart beat for student engagement, more students will pursue their degrees locally, students will be drawn from a larger area and student retention will increase,” Lingle said. The celebration featured President McRobbie and Cruz-Uribe as well as special guests. To kick off the celebration, IU East’s seven All-Americans of the National Association of Intercollegiate Athletics (NAIA) joined each other on stage including alumni Tyler Rigby ‘12; Lauren Crump, ‘13; Breezy Strete ‘13; Tyler Fangman ‘15; Mallory Livingston ‘15; and current student-athletes Lucas Huffman and Tia King. Special guest speakers included Victoria Duval, professional tennis player and current student; Keith Fargo, ’97, a director for the National Alzheimer’s Association; and Stacie Van Dyke, ‘11, an Emmy-award winning anchor and reporter. Paul Lingle, president of Lingle Real Estate, and Rob Quigg, executive director of the Quigg Family Foundation and treasurer for Richmond Baking, were also special guest speakers. 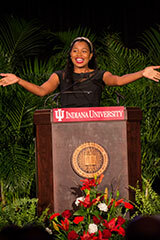 Duval, of Bradenton, Fla., is a freshman majoring in business administration online at IU East. Duval has overcome adversity throughout her life including being held at gunpoint and held hostage at age 7 while living in her parents’ native Haiti; her father was trapped under the rubble of their home during the 2010 Haiti earthquake but pulled himself free after 11 hours; in 2014 she was playing at Wimbledon when she was diagnosed with Hodgkin’s lymphoma. She went on to play three more matches at Wimbledon before ending her play in the tournament; however, she broke into the world top 100 and was ranked 92nd. She is now cancer free. Van Dyke is an anchor and producer for ABC affiliate WDAZ News in Grand Forks, N.D. She has received awards from the Midwest Broadcast Journalists Association, Society of Professional Journalists, the Associated Press, and she was named the 2013 Merit Award for “Best Anchor” by the North Dakota Broadcasters Association. As an undergraduate at IU East, Van Dyke completed an internship at the CNN Newsroom in Atlanta. Following graduation, she was a sports reporter in central Florida. She is a native of Indianapolis. Fargo is the director of Scientific Programs and Outreach, Medical and Scientific Relations for the National Alzheimer’s Association. He received a Bachelor of Science degree in Behavioral Sciences with a concentration in Psychology from IU East. He was the Naomi R. Osborne Scholar, an honor given to the graduate with the highest grade point average, for his graduating class. Professional performances were provided by alumni Adam Cappa ‘09 and Tyler Johnson ‘16. Cappa, of Richmond, Ind., is a Christian recording artist, who went from being a local musician to signing a national record deal and touring across the country, Cappa earned a general studies degrees from IU East. Johnson, of Fountain City, Ind., received his Bachelor of Arts in Humanities with a concentration in music in May. He is a 2012 Lingle Scholar, a four-year scholarship given to an incoming freshman who has been accepted to the IU East Honors Program. The guest announcer, Dennis Hicks, is the voice of the Red Wolves during men’s basketball games and volleyball matches. He is also the registrar at IU East. Earlier in the day, Indiana University and IU East led a formal Dedication Ceremony for the Student Events and Activities Center. Over 200 people attended the 2 p.m. Dedication Ceremony held in Vivian Auditorium. 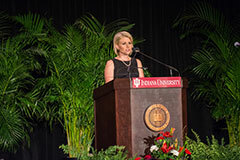 During the formal university ceremony, remarks were provided by IU President Michael A. McRobbie; IU East Chancellor Kathryn Cruz-Uribe; Angie Dickman, IU East Board of Advisors president and a campaign co-chair; Felicia Quigg, co-chair and member of the IU East Board of Advisors; and Lizzie Miller, president of the Student Government Association (SGA). IU Trustee James T. Morris also participated in the dedication. At the dedication, Chancellor Cruz-Uribe said IU East’s enrollment is important as IU’s regional campuses play a critical role in helping Indiana reach its goal of increasing educational attainment throughout the state. Dickman said the Student Events and Activities Center dedication is a celebration of the transformation of IU East. “The center is truly an investment in all current and future students of IU East and ultimately our community. Thank you to all who contributed to this important project. This vision could not be a reality without you. IU East and our entire region will enjoy and benefit from this center,” Dickman said. Quigg said IU East has been a staple in the community and that IU East is continuing to grow and thrive. “College is where we earn our degree, but perhaps just as important, it’s where we learn who we are. That identity is created by experiences on campus, in and out of the classroom as we develop life skills through interactions and problem solving,” Quigg said. IU Trustee Morris presented President McRobbie with the key to the building. “May this beautiful new building open up a world of possibilities for our students, and for everyone who is served by the IU East campus,” Morris said. President McRobbie concluded the ceremony with the official dedication of the Student Events and Activities Center. To conclude the Student Events and Activities Center Celebration, IU East Chancellor Cruz-Uribe announced the largest ever gift given from an alumn. The $1 million gift is from an anonymous donor. The donor has the desire to help others succeed and to improve their life through higher education. The donor’s gift is to provide students with financial assistance through scholarships to complete a degree. This gift counts toward the $2.5 billion campaign, For All: The Indiana University Bicentennial Campaign. IU East’s campaign goal is $7 million, which will help fund a variety of campus initiatives, student scholarships and strategic projects. Find out more about IU East and ways to assist the campus at iue.edu/development. Construction on the Student Events and Activities Center began in July 2015. A Groundbreaking Ceremony for the center was held in November 2014. MSKTD & Associates designed the Student Events and Activities Center. The Student Events and Activities Center is 17,759-square-feet. The public fund raising campaign, Bold Aspirations: The Campaign for the Student Events Center, began in October 2012. Nearly $2 million raised by that campaign has been supplemented with $3 million from IU East through savings and efficiencies. Through the “Save My Seat” campaign, approximately 125 IU East faculty, staff and community members supported the Student Events & Activities. Those participating in the campaign contributed $500 or more. The center features a display listing the names of each donor.